This Ribbon Heart Mini Quilt is perfect for Valentines Day or any day that you decide needs a little more love! It’s the perfect nursery wall decoration gift. This pattern is an email-delivered PDF pattern for a mini quilt that finishes at 16.5 x 12.5″. Ribbon Heart Mini Quilt contains detailed instructions and diagrams so that any directional fabrics used (stripes, etc) will all run the same direction across the mini quilt. The pattern also has instructions to create the cute little contrast insert in the binding. Click on any of the photos below to enlarge (including the fabric requirements). 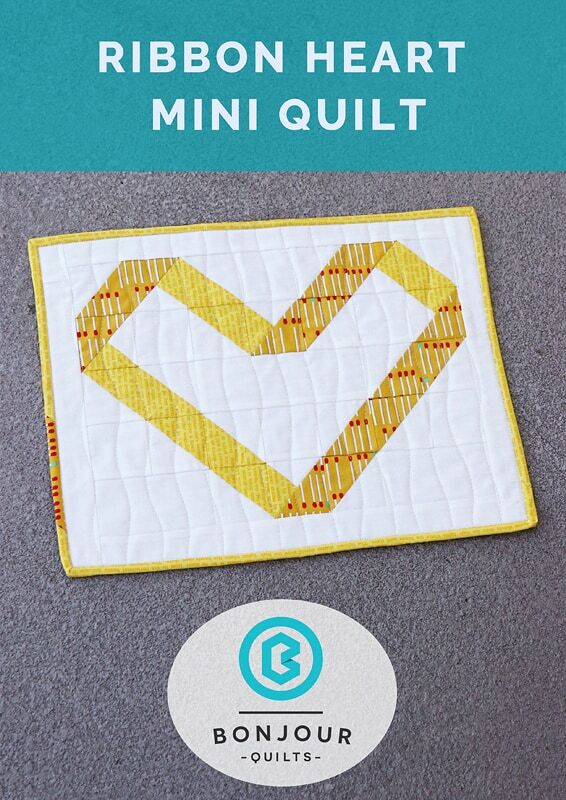 The Ribbon Heart Mini Quilt pattern will be emailed automatically to your inbox in the form of a downloadable link. You will be able to access the link three times before it times out – so make sure you save the pattern to your hard drive before then! If you have trouble saving to an iPad/iPhone (which is common), try saving to a laptop or desk top.